The ‎Vice-Chancellor, Professor Kolawole Salako has stressed the need for religious tolerance, peace and harmony among members of the University Community. Professor Salako called for peaceful coexistence at a Juma’at Service held at the University Mosque and Sunday Service at the Chapel of Grace , FUNAAB. Addressing members of staff at the Service held at the University Mosque, Professor Salako said that he does not discriminate against any religion but rather accepts people based on their disposition and attitude to work. The Vice-Chancellor who reiterated his commitment to justice and equity, charged members of the University Community to channel their grievances to him, assuring that he would always listen and address them without fear or favour. He admonished the students in particular, to always be of good behaviour by showing respect to constituted authorities, abide by the rules and regulations of the University and report any form of harassment to him. Professor Salako who expressed gratitude to the Muslim Community for their support, solicited for more cooperation and prayers for the success of Management and the University. Appreciating the Vice-Chancellor for the visit barely two weeks in office, the Amir of the University’s Muslim Community, Professor Kehinde Okeleye said, “this is a rare show of your distinguished leadership qualities”. He assured Professor Salako of the support and cooperation of the Community, saying, “as you have assumed office, be rest assured of the support of this Community towards the attainment of your vision for the University. We are a Community of law-abiding people, operating within the laws of the Federal Republic of Nigeria and those of FUNAAB. We shall co-operate with your administration as we have done with the past administrations”. Earlier in his sermon, the Chief Imam of the Muslim Community, Professor Idris Ayinde charged the Vice-Chancellor to beware of sycophants, not to be vindictive but to be tolerant and avoid taking hasty decisions. Special prayers were offered for Management and the University. Meanwhile, the Vice-Chancellor, Professor Kolawole Salako has stated that he is a testimony of the existence of God. Professor Salako who assumed office recently disclosed this while worshipping with the University’s Christian Community. According to the Vice-Chancellor, “My emergence as the Vice-Chancellor of this University was placed in the hands of God. I am not holy and I am not claiming I am holy. Only God is holy. Let us all believe firmly in God. It is God that qualified me for this position”. Rendering a song of praise, the Vice-Chancellor who is a Professor of Soil Physics stated that it is always good to thank God. whether you got one thing or not. 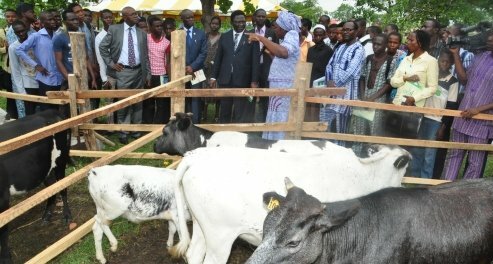 In his sermon titled, “The Christian, a soul winner”, the Chaplain of the Chapel and the immediate past Dean, College of Animal Science and Livestock Production (COLANIM), Professor Christian Ikeobi stated that soul winning was the utmost priority for christians, noting that no excuse was permitted for not carrying out the duty. Highpoint of the Service was the prayer upon the Vice-Chancellor, his wife Mabel, Principal Officers and the University community. Special prayers were offered for the success of the Vice-Chancellor, his family, Principal Officers and the university in general.